Oscar Peterson became a sensation in the jazz show Jazz At The Philharmonic in the early 1950s. His trio recordings and work as an accompanist made him one of the most prolific jazz stars in history. 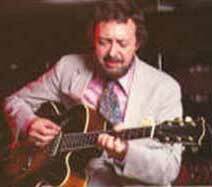 In the mid 1940s Barney Kessel played in the big bands of Artie Shaw, Charlie Barnet et al. but also recorded with Charlie Parker. He appeared on more than 60 albums between the 1950s and 1988. 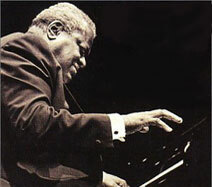 Oscar Peterson performed as accompanist for a who's who of jazz soloists and vocalists. His recordings with several incarnations of the Oscar Peterson Trio are superb to fans of straight ahead mainstream jazz that swings. Mr. Peterson died of kidney failure 12-23-2007. What Is Mainstream Jazz Music? Above are some of the greatest mainstream jazz musicians in the history of jazz music. The jazz critic Stanley Dance is generally credited with coining the phrase mainstream jazz. Dance used the term in reference to some of the jazz musicians of the 1950s who continued to play in the swing style of the Big Band era, only in smaller, downsized groups. Frankly all of the musicians mentioned on this website can fit under a single banner called simply jazz musicians that swing. However for ease of navigation we have found it necessary to categorize these jazz greats. This is a process that few of them would have liked and you will note that a good many crossed between a number of different styles of jazz throughout their careers including Swing, Cool Jazz, West Coast Jazz, Bop, Traditional and even Contemporary Jazz. In recent times debates have been commonplace on what constitutes swing music and what should be classified as "real" jazz music. We make no distinctions or further classifications in relation to what the music we play is classified as. This, we feel, is better left to expert debaters. We simply enjoy all jazz that swings and attempt to provide listeners of our jazz radio show historical background information of the recordings and musicians who have performed such music since the history of jazz music began. A late 1990s resurgence of interest in jazz dance and swing dancing fueled by a Lindy Hop and Jitterbug swing dance craze somewhat confused the general public's perception of the common link between swing music and jazz music. Our radio show makes no claim to be specifically a swing dance radio show, but rather a jazz radio show that features swinging straight ahead jazz music. However if the music we play doesn't make you want to pat your foot, pop your fingers, or shake a leg... check your pulse. That being said, if you are of the mind that Dizzy Gillespie or Charlie Parker never played jazz music that swings keep listening. A vast world of jazz music awaits you and welcomes you with open arms.